Last night we had our lathe up and running for the first time since we moved to Blackpitts. We were using it to centre-drill some rollers that are part of a 100 year old mangle. One of our members is restoring the mangle to use as a printing press. Keep an eye out here on our website for details of the project. 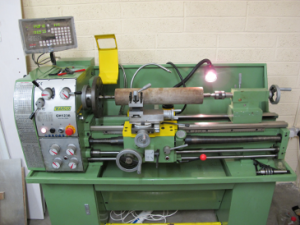 If you’d like to take a look at the lathe, drop in sometime. The other major piece of equipment that we are almost ready to restart is our laser cutter. We’ve already had the laser firing and are working on alignment. Watch this space. This was written by gary. Posted on Tuesday, June 21, 2016, at 6:12 pm. Filed under Project, Tools. Bookmark the permalink. Follow comments here with the RSS feed. Post a comment or leave a trackback.